There are several types of fire severity maps that you may see. Although they look different for the same fire, they may also all be accurate. This is because fire severity is a measure of the fire effects on a specific resource such as soils, tree canopies, vegetation or wildlife habitat. Burned Area Emergency Response (BAER) maps are primarily measures of fire effects on soils. The following is a description of BAER fire severity mapping for soil burn severity levels. High Soil Burn Severity Rating: (severe damage to the soils): deeply burned soils with high water repellent soils (tend to be places where the fire burned the forest canopy, ground cover, roots, and organic matter in the topsoil). Moderate Soil Burn Severity Rating: burned soil with moderate water repellent soils (much of the root, soil structure, and organic matter stayed intact and could help buffer the rainstorms that could cause erosion) can produce increased water run-off and soil erosion depending on the timing, magnitude, and duration of future precipitation. The remaining vegetation could quickly re-sprout and provide some cover from dead needles and leaf fall to reduce erosion. Low Soil Burn Severity Rating: light soil burning includes land that may have burned in recent occurrences with brush or young timber growing on it. Wildfire does not always impact soils and vegetation in the same way. A hot, fast moving fire (wind driven) can consume the majority of vegetation (especially when dry with low fuel moistures) in a burned area and can be classified as a high intensity fire area by fire ecologists/fire behavior analysts, but moves through so quickly that the soils remain largely intact. When the duration (also described as residency time) of the fire is short (fast moving-wind driven), it can result in a low-to-moderate soil burn severity rating by BAER soils scientists because the soil did not get a lot of lingering heat on the ground. Fire severity is a measure of the effects of fire on a defined resource. All fire severity maps view landscapes from different perspectives, so various maps of the same fire can look very different, and all be accurate. The BAER soil burn severity (SBS) maps specifically focus on severity to soils and watersheds. 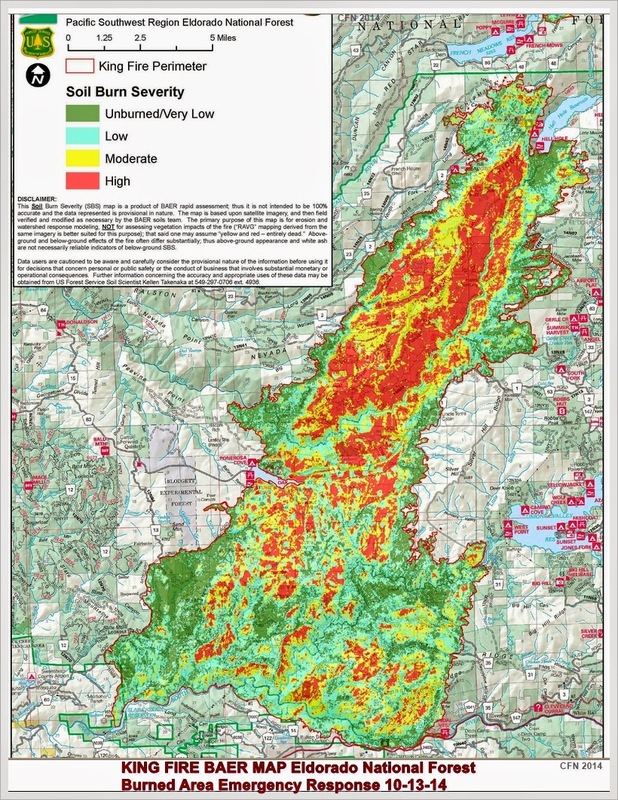 There are also a number of other types of fire severity maps – many of which focus on different aspects of vegetation such as, Burned Area Reflectance Classification (BARC) and Vegetation severity maps are both vegetation maps but will also look different for the same location and time. Vegetation severity maps also come from a number of different perspectives, and can be short-term or long-term views. The correlation between fire intensity and soil burn severity is not always direct because the amount of heat generated and time duration both plays a critical role in the fire effects to soil. Ground cover refers to the organic material on the top of the soil layer, and includes vegetative litter, duff, and woody debris/fuel. When a fire slowly consumes fuel (long residence time), the fire (soil burn) severity is usually high. When organic material within the ground cover and within the soil structure burns at high intensity, some of the water repellent components vaporize, and condense on the soil at the surface or deeper depending on the severity of the fire. Because of the variability of fuel consumption, soil heating typically is non-uniform across landscapes. During post-fire assessments, the BAER team uses the term “soil burn severity” to differentiate post-fire soil properties from fire effects on vegetation (such as tree mortality), and/or general fire effects on the long-term ecosystem health. Soil scientists evaluate preliminary burn maps from satellite imagery to determine the effects and create a soil burn severity map. Hydrologists use that information to model storm runoff over the burned area to estimate potential flood impacts to lives and property. Foresters use the same satellite images to create a different map that displays post-fire impacts to the trees.